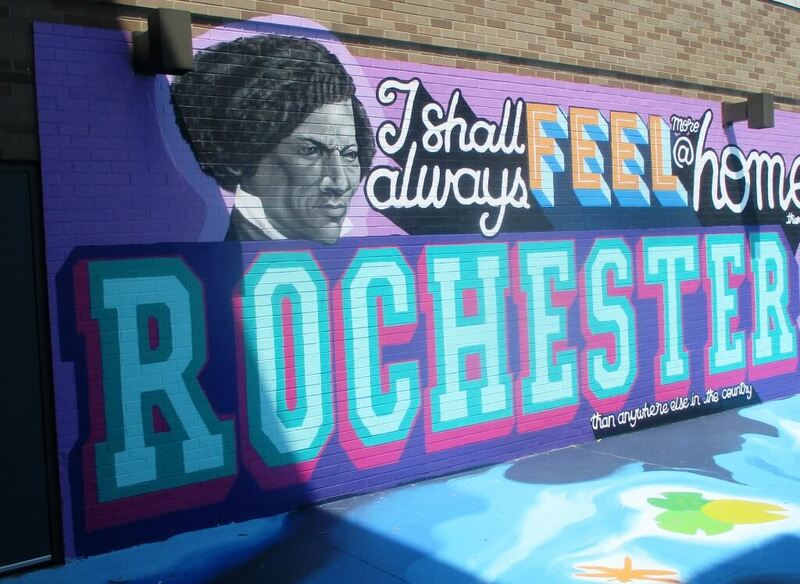 As seen in Discovering Frederick Douglass, images of the world historical figure of Frederick Douglass dot the landscape and cityscape of Rochester. 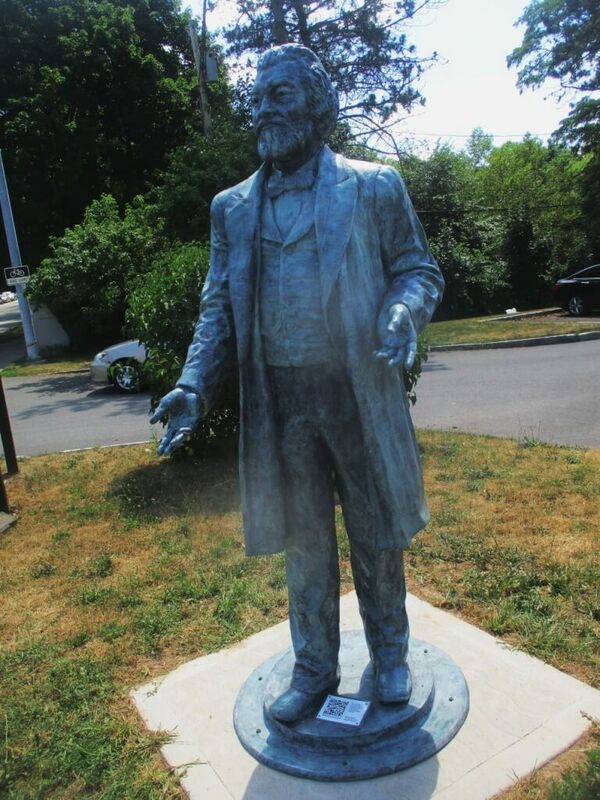 Today, newly constructed statues of Douglass were installed in locations across Rochester, including at his homestead next to the newly renamed Anna Murray-Douglass Academy. Local artist Olivia Kim is creating 13 replica statues similar to the iconic monument of Douglass in the Highland Bowl. Kim is a 1997 graduate of SOTA and an adjunct professor at RIT. 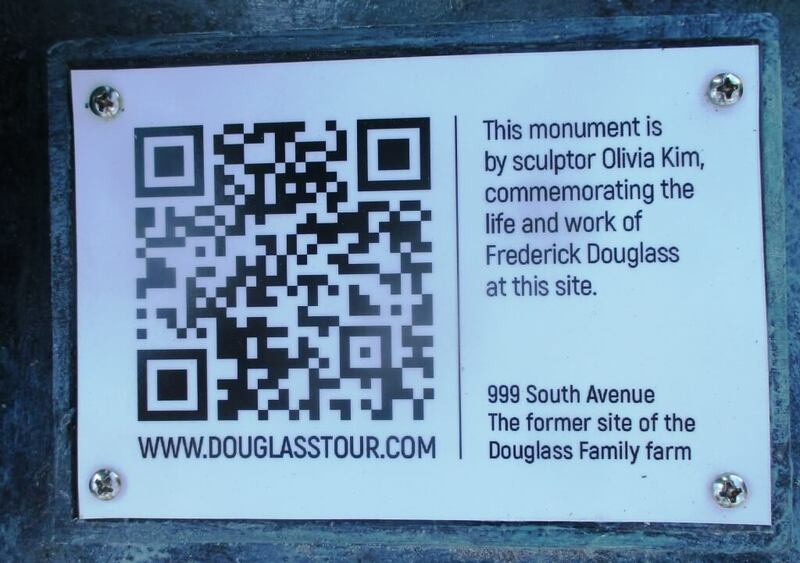 Kim’s sculpture is more an interpretation than an exact replication of the 1899 Douglass monument. As Kim says about her artistic approach: My sculptures seek to convey the ever-changing architecture of the human being. That is, the Douglass of 1899 needs to seen in the context of 2018. 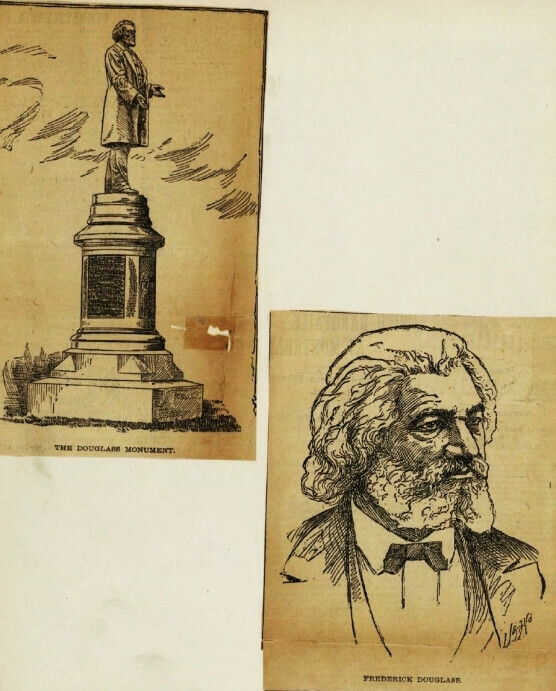 Images from the Democrat and Chronicle at the 1895 unveiling of the Douglass Monument. From Frederick Douglass scrapbook, 1884-1905. Held at the Rochester Public Library. 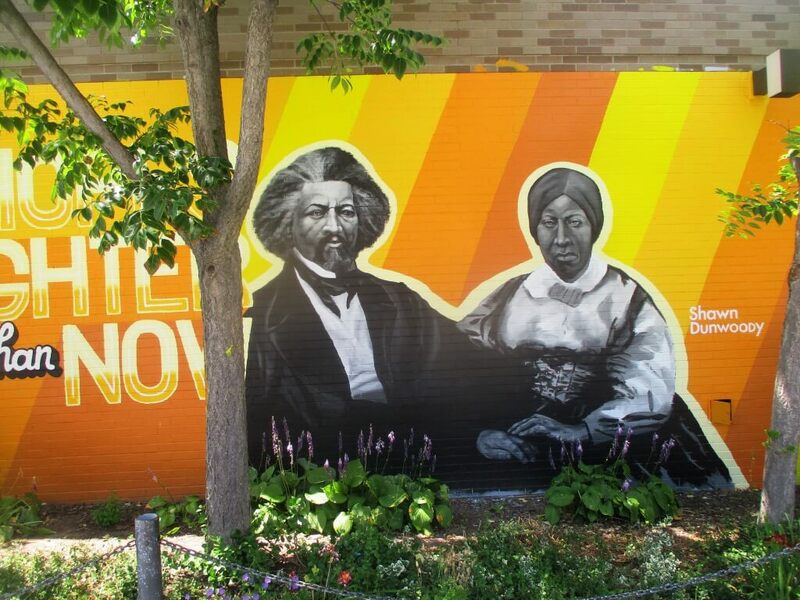 The new statue adds to the murals created by Shawn Dunwoody including two recent ones that adorn the nearby Frederick Douglass Library. Recently, the former P.B. 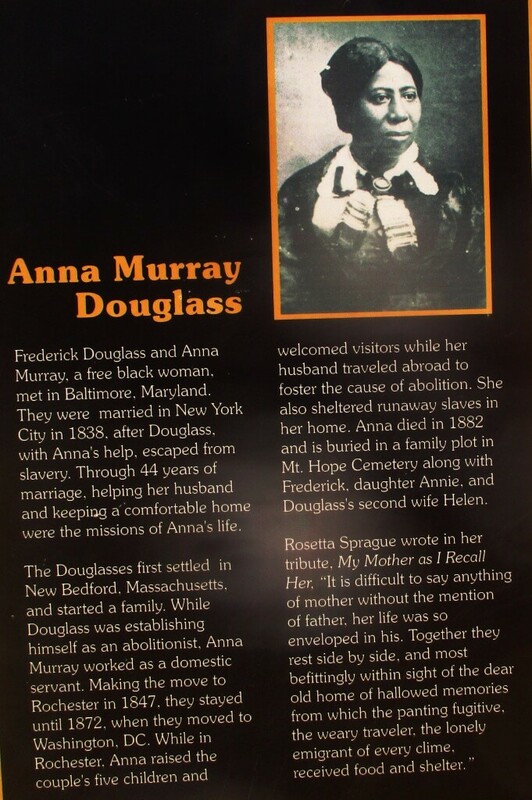 Duffy School # 12 was renamed the Anna Murray-Douglass Academy. As seen in Thoughts on changing the name of the James P.B. Duffy School, the new name makes sense given that the site was once the Douglass homestead and we are celebrating the bicentennial of Frederick Douglass’ birth. At the same time, I, and others, have worried that the legacy of James P.B. Duffy might be forgotten. I spoke with Principal Vicki Gouveia who assured me otherwise. The library will be renamed in Duffy’s memory and his oar will always proudly hang on the school wall. From the plaque describing the Douglass homestead on South Avenue.